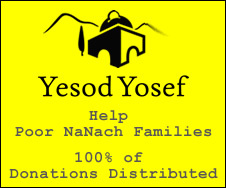 Na Nach Nachma Nachman Meuman: Say Na Nach by Rabbainu, give a penny to charity, and get the full guarantee! Say Na Nach by Rabbainu, give a penny to charity, and get the full guarantee! B"H on Shabbos I realized how the Rabbis have prevented us from bringing the world to Rabbainu. If we would really believe in Na Nach Nachma Nachman MeUman we would make it known and clear to the whole world that all they have to do is come to the holy tomb or Rabbainu and say Na Nach Nachma Nachman MeUman and give a penny to charity - and with this they will have achieved Rabbainu's guarantee that he will do his utmost to help them and even drag them out of hell. Rabbainu says in Likutay Moharan (II 86) that due to insufficient faith people have to hard devotions, but if a person has complete faith devotion to God doesn't entail any hard work what so ever. In this same vein, only those that don't believe fully in Saba, the Petek, and Nanach, feel incumbent to force others to say the whole tikun Klali, something which is out of the reach of most people, where as if we would tell them that they can get the full tikun by saying Nanach they would be excited tremendously to give it a go. They can say the Tikun Haklali in any language, and this not beyond anyone. In this way they will fulfill the Rabbi Nachman's exact wishes. Did Saba say that one could get the full tikkun by saying nanach? No he didn't, as far as I know. "Na Nach has all the rectifications" yes Saba did say that. Just say Na Nach. He said it a lot. I would recomend reading Saba Israel. "Only to mention the name of Rabbeinu Na Nach Nachma Nachman MeUman. that is enough. It is an easy thing to say, and one who says Na Nach, he grasps,he enters the root of the Creation, the root of all the Torah and all the Tzadikim, He enters into another world. Just to say verbally this Holy name, Na Nach Nachma Nachman MeUman, it sweetens ALL the troubles, and all the judgments and all the sins and all the downfalls and alll the heresy of the world.This is enough to demolish ALL the forces of evil, all the forces of darkness, everything, it transforms everything. etc. etc. " Israel SABA pg. 571. He says this many many times to many people, it has been recorded. Everyone who is into Saba knows this. If you want the Truth of Na Nach, read the book Israel Saba. It has all the answers. If you are serious. "Yes, to say Na Nach all day long, this is the key to all the healings, to ALL the salvations, this is EVERYTHING, Everything! Na Nach, this has a power, this opens all the gates of mercy, all the gates of prayer, all the gates of repentence, all the Torah, It has ALL that we need. The whole world needs to be filled with Na Nach..." Israel SABA pg. 571 I recomend that you read this book, 99% of your questions would be answered. Na Nach's don't know as much about Na Nach as SABA does. If you want to know what is Na Nach read the book "Israel Saba"
Saba also said in Israel Saba: "When one needs a healing, one should say Tikkun HaKlali, someone who fell, G-d forbid, then immediately - he is as if nothing has happened. Tikkun HaKlali - this is the light of the Messiah! (Saying) Tikkun HaKlali by the grave of Rabbeinu - this is a rectification of which we have no conception!" So it seems that according to Saba saying Na Nach is not in place of saying Tikkun HaKlali. Each has it's own place and purpose. Too often NaNachs say things which are not necessarily what Saba said or intended. Saba never said that saying Na Nach doesn't replace Tikune Haklali. Too often people who are NOT NA NACh try to make Saba's path more complicated then it needs to be. Na Nach has all the rectifications means All. Saying Tikune Haclali is good. Saba didn't say it any more when he was older but he did say Na Nach. Believe what you want, we'll find out. But did Saba say that saying Na Nach replaces Tikkun HaKlali? Yes Or No? Simcha, please feel free to assist here. You are the one who wrote this piece and I simply want to know if what you wrote is what Saba said or if it is your own view / understanding. And Anunimi - chill out. I'm just trying to search for the truth. No need to get so defensive (another NaNach trait). Nothing Personal Avraham, but what you said was a bit offensive. "Too often NaNachs say things which are not necessarily what Saba said or intended." This is a stereotype I don't like to be stereotyped and I think that stereotyping is a very bad trait for someone who is "just trying to search for the truth" I'll chill. sorry if I erked you. Just trying to publish the truth. BH just picked up on this thread now, and I'm happy to see that Anunimi has provided the comments with the right groundwork. Saba said explicitly that Na Nach Nachma Nachman MeUman is the song that is single double triple quadruple, and if you look at the prayer which is printed with the Tikun Haklali you will see that the whole purpose of the Tikun Haklali is just to arouse the song that is sdt"q, so obviously saying Nanach is much more effective. For many years I didn't say the T"H, even though I was disseminating it, because I was relying on Nanach. More recently I resumed saying the TH, because after all it is prayer and praised to H"Y and a Breslover custom to say it, however there is no doubt that Nanach is much much more higher - as anunimi pointed out, Saba said that for a long time he had stopped saying th, but Nanach he was saying day and night. Saba even said that he did not give Nanach proper respect!!!!! So anyone who begins to understand this properly will be moved even to hysteria, why we don't make a full out campaign to save so many people with this simple and critical tikun!